Grilled chicken is a summertime staple. This tangy three ingredient orange barbecue sauce will take your chicken from everyday to extraordinary. Mix barbecue sauce, orange peel and juice. Reserve 1/2 cup of the barbecue sauce mixture. Pour remaining barbecue sauce mixture into shallow baking dish. Add chicken; turn to evenly coat both sides of each chicken breast. Cover. Refrigerate 30 min. to marinate. Drain; discard marinade. Preheat greased barbecue to medium heat. Grill chicken 12 to 15 min. or until cooked through (170°F), turning and brushing occasionally with the reserved 1/2 cup barbecue sauce mixture after 8 min. 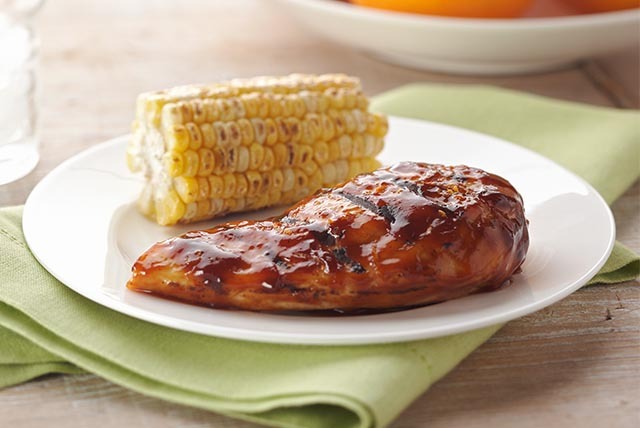 Prepare as directed, using Kraft Brown Sugar BBQ Sauce. Lightly brush the cold barbecue grate with oil (or spray with cooking spray) before preheating the barbecue.